Standard 7800 joysticks, compatible with the 2600. 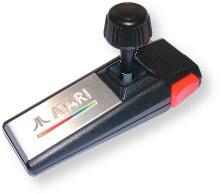 Marketed as advanced controllers, featuring independently functioning buttons (7800 only). Long, narrow design. Records Found: 74 Click on a column header to sort by that column. Click again to reverse sort order.